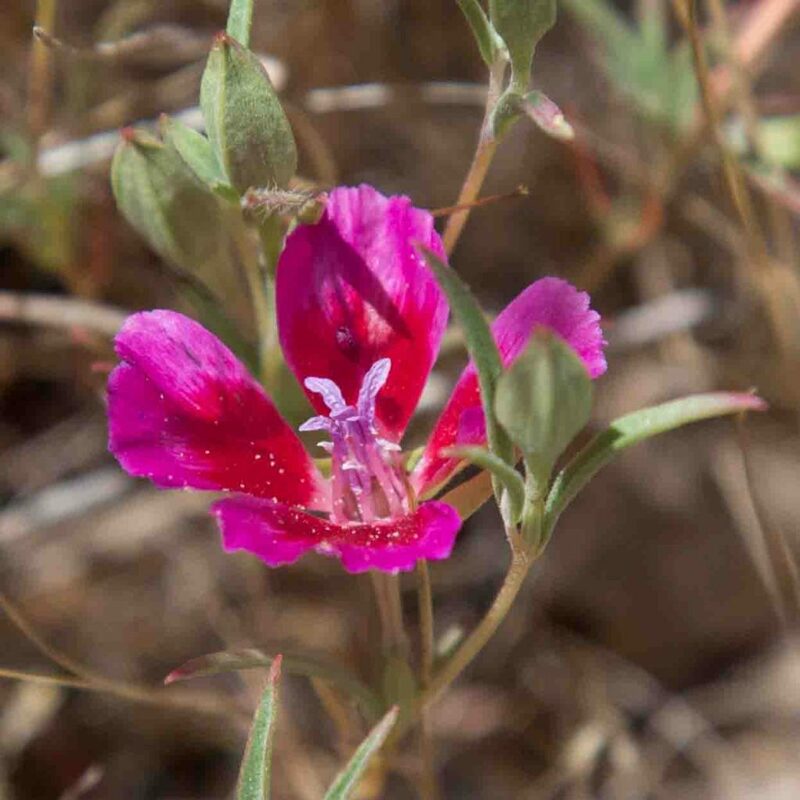 Clarkia is a particularly attractive genus with a wide variety of flowers. Some are immediately recognizable but others require careful attention to such details as whether the buds are upright or nodding, the size and shape of the fruits, whether the stamens are all of the same length and whether the axis of the inflorescence is straight or recurved. 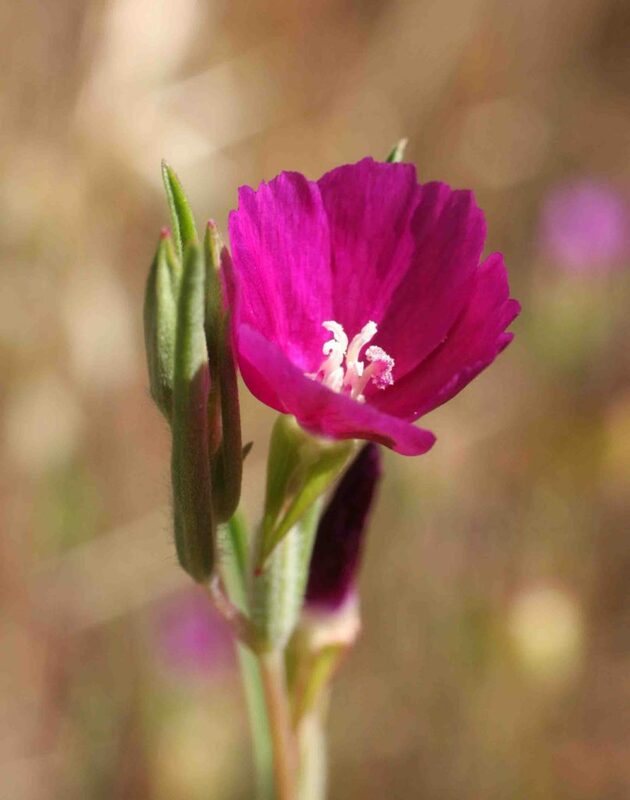 The Four-spot or Winecup Clarkia (Clarkia purpurea subsp. quadrivulnera) deserves a special mention for the variability of its flowers. 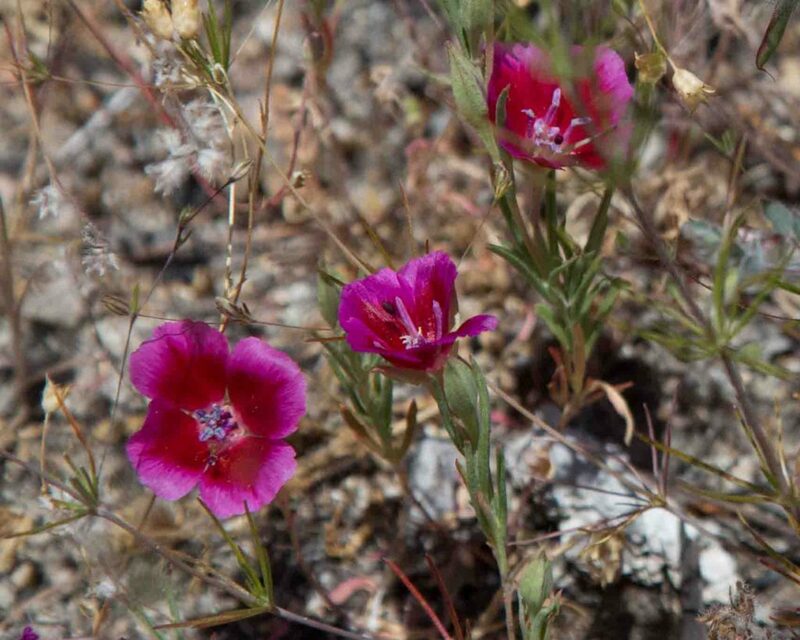 Like Four-spot Clarkia (Clarkia purpurea subsp. 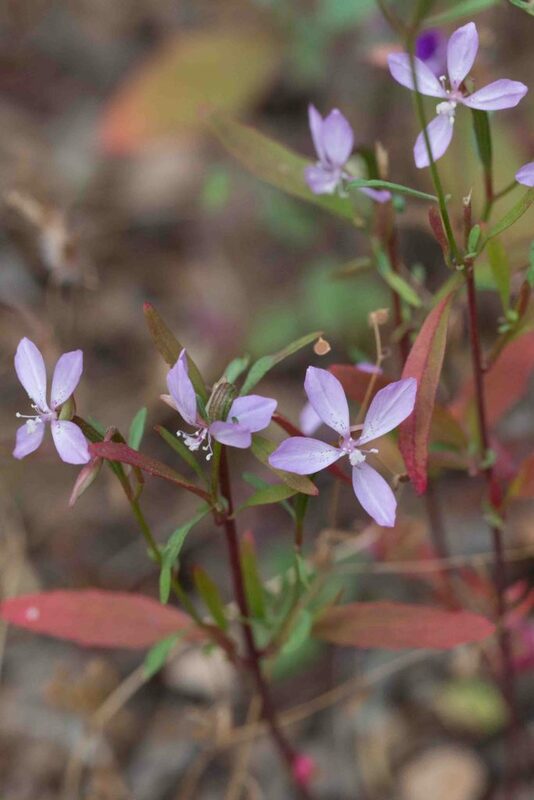 quadrivulnera), this has erect buds and smallish pink to lavender (occasionally deep maroon) flowers with 8 stamens similar in length and color. Petals are often red-flecked. 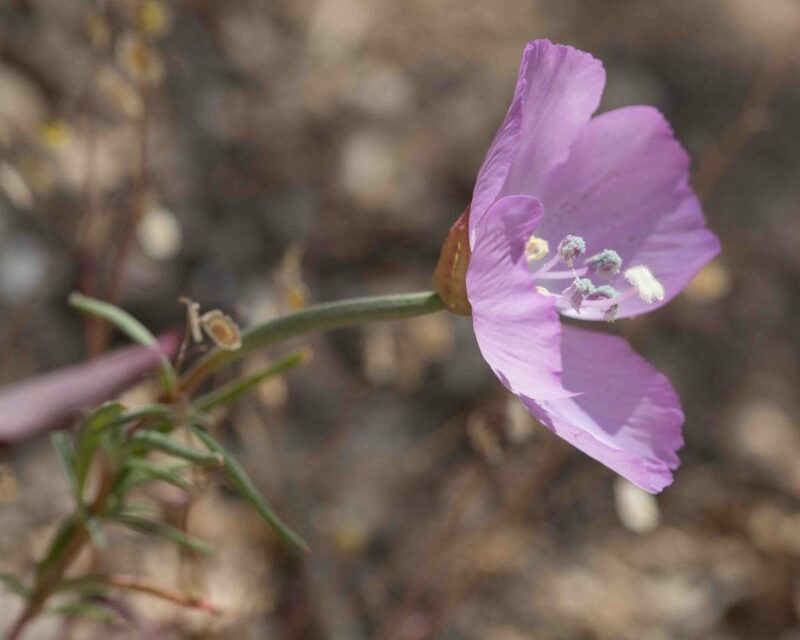 It is most easily distinguished by its fruits which are longer and proportionately narrower (> 9 × as long as wide) than those of Four-spot Clarkia (which are < 8 × as long as wide). 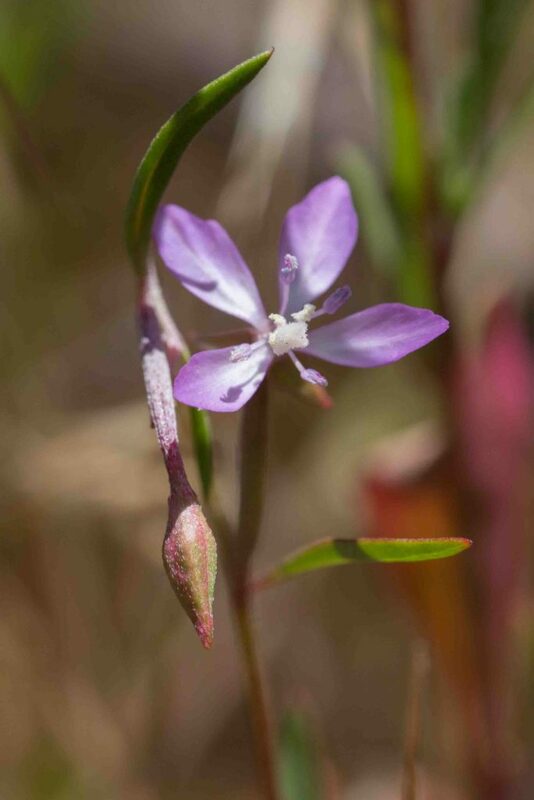 This is more common inland and in the south or southeastern parts of the county. 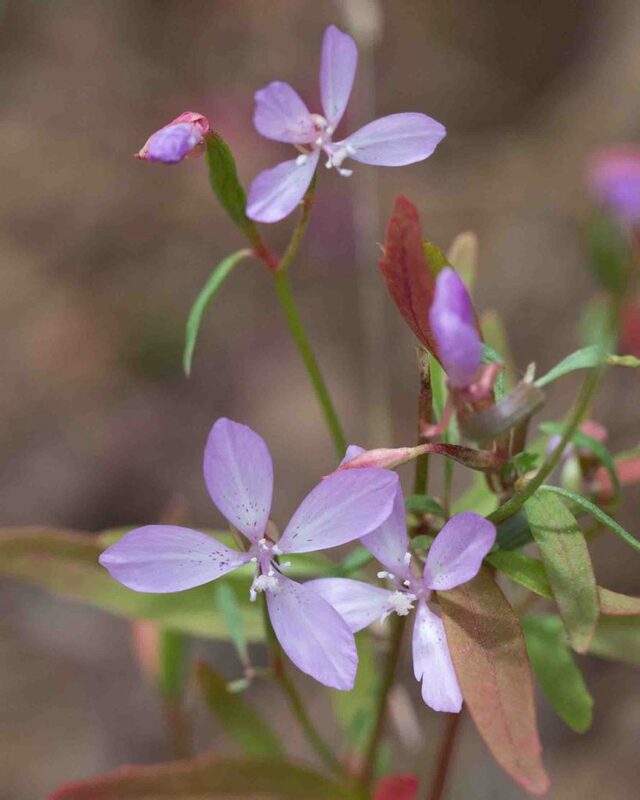 A small plant with smallish, obovate petals which begin white and fade to pink with age, not flecked with purple. Buds are nodding. 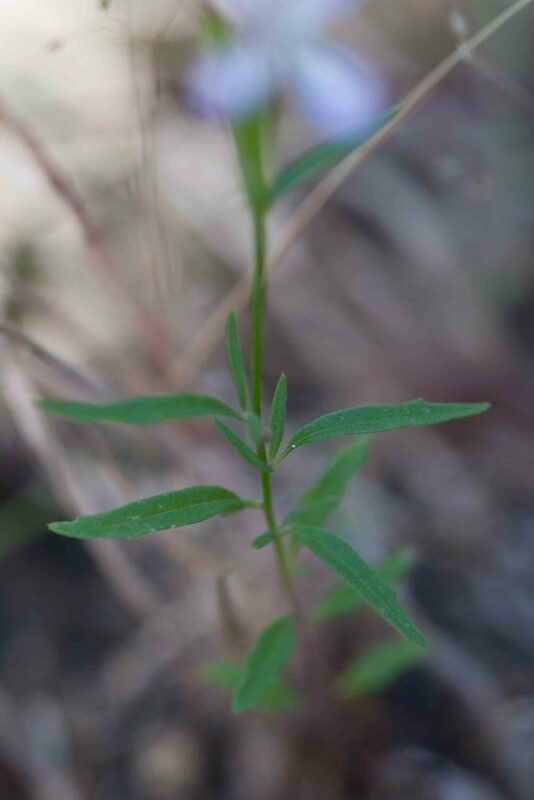 Leaves are linear to narrowly lanceolate or oblanceolate. 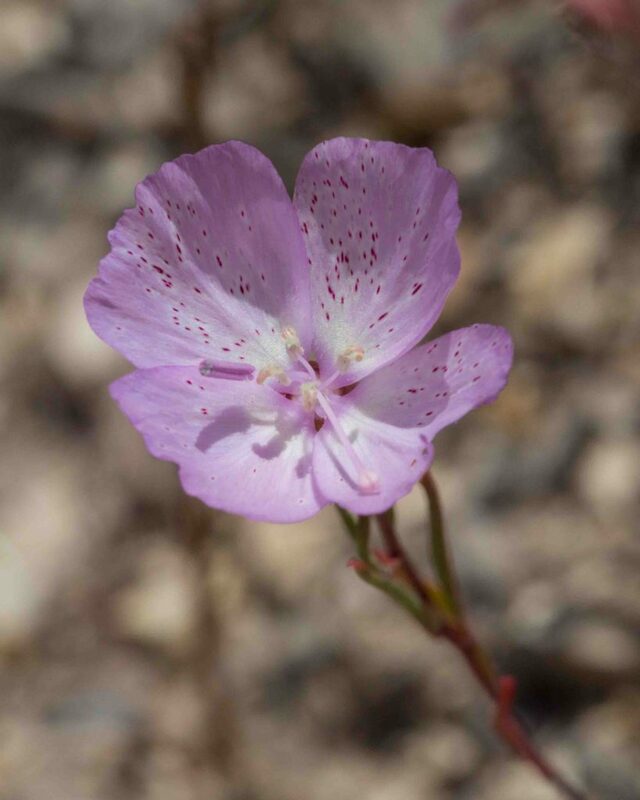 Sepals remain fused in 4s or 2s, often reddish in color. 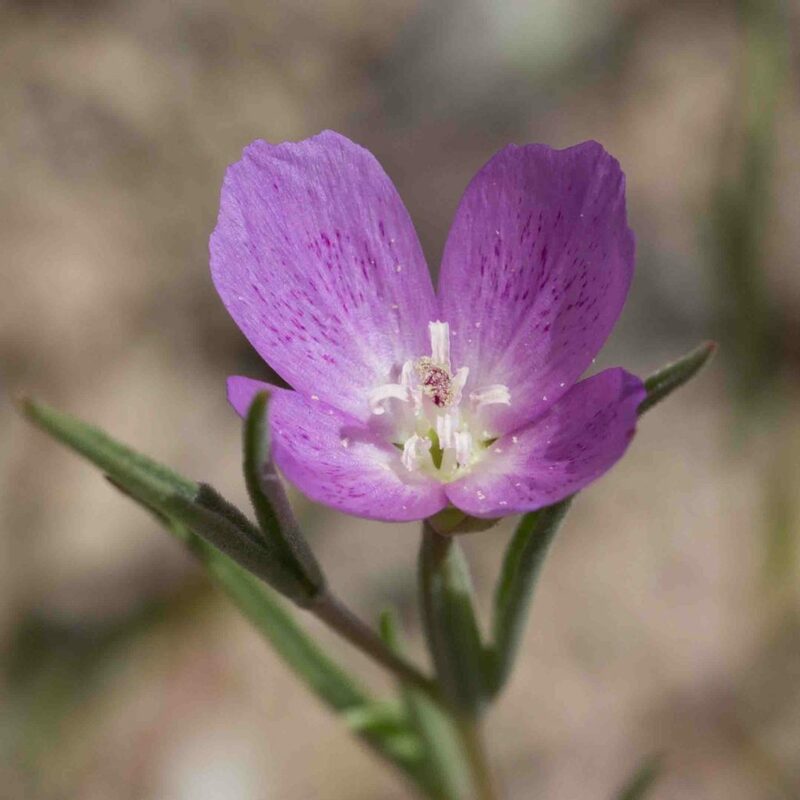 Found only near Jolon, this could easily be mistaken for Lewis’ Clarkia (Clarkia lewisii) but can be distinguished by the absence of any red line at the base of the petals and, more importantly by the axis of its inflorescence which is erect rather than recurved. Buds are reflexed though becoming erect as the flower opens. 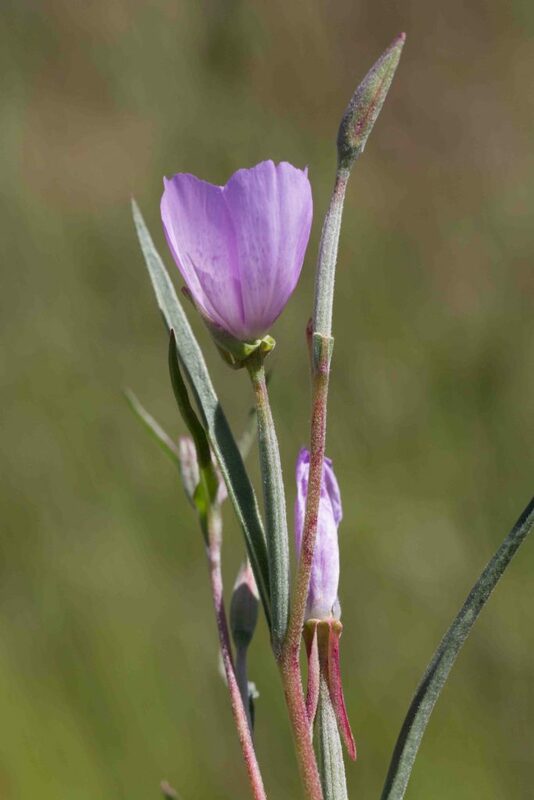 The anthers are variable, the outer being longer and lavender, the inner shorter and paler. 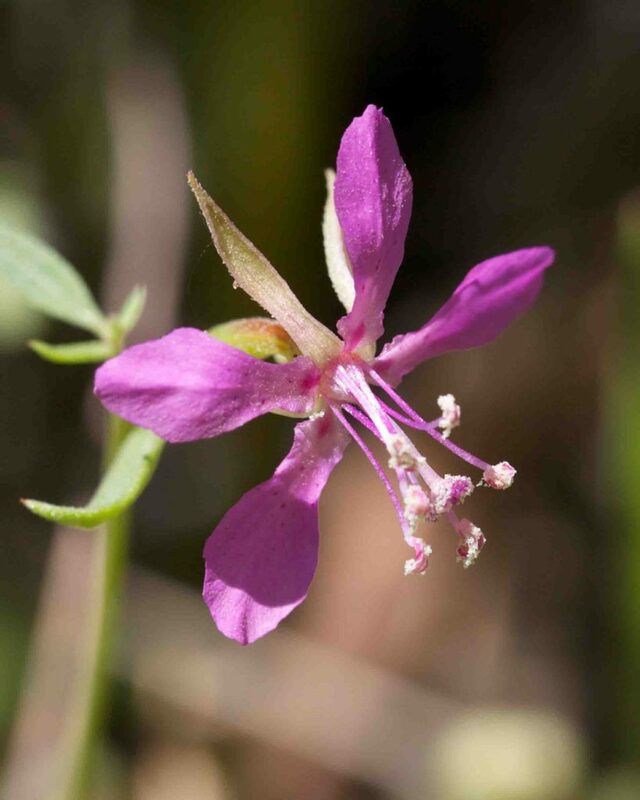 Found only in Monterey and San Benito Counties, this clarkia is common on the Peninsula. Petals are 1–3 cm, pink to lavender, generally with pink speckles and often with a dark pink or red line across the base of the petals. Buds are nodding. 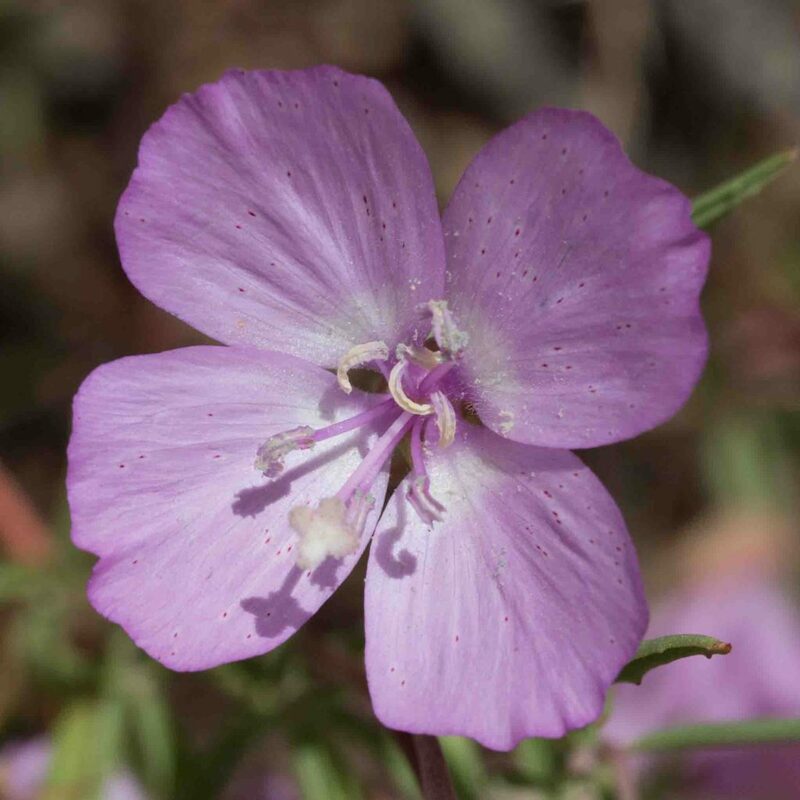 The outer anthers are lavender and noticeably longer than the inner, paler anthers. 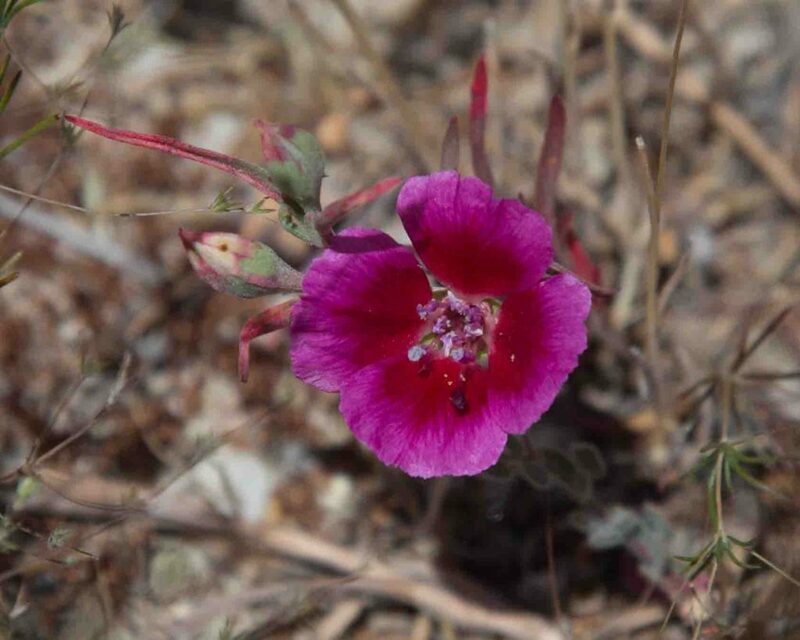 The entire base of the petals is occasionally deep crimson, similar to Ruby Chalice Clarkia (Clarkia rubicunda) but the plant can be distinguished by its nodding buds and the two different forms of its anthers. 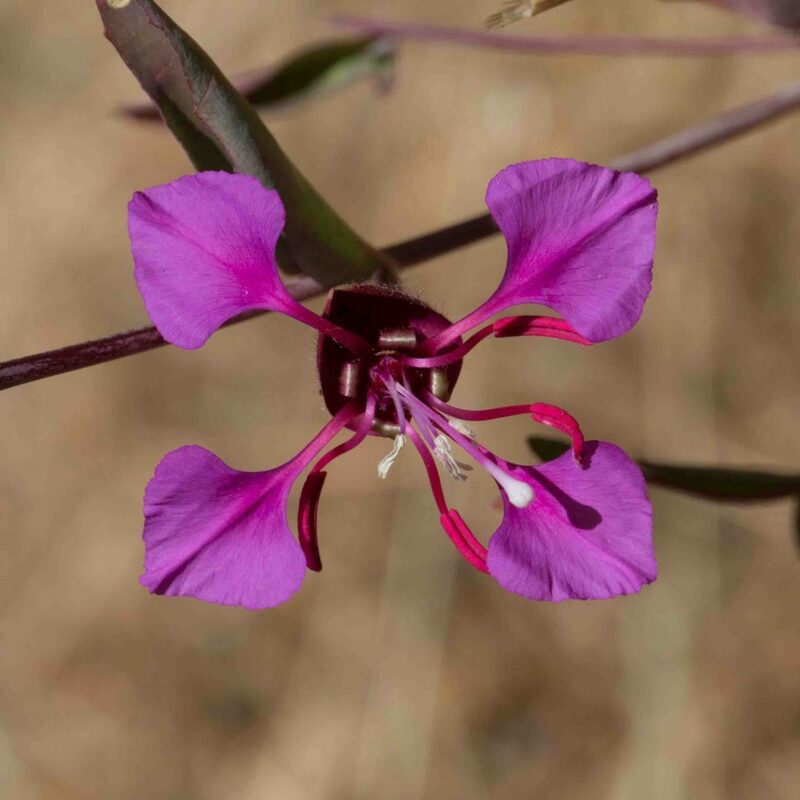 Sometimes commonly called Farewell to Spring but this can cause confusion with the often cultivated Clarkia amoena. 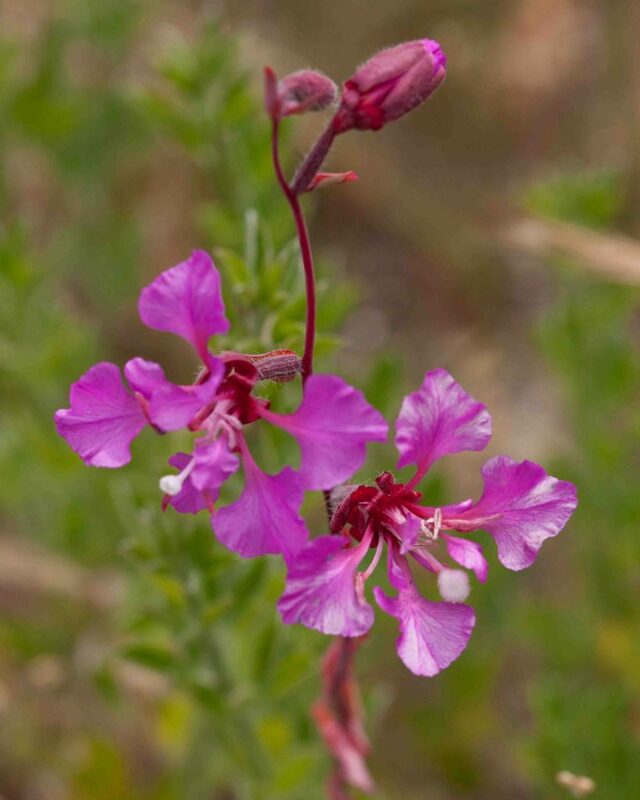 It has rose-pink to lavender petals, obovate to fan-shaped generally with a prominent reddish zone at the base. 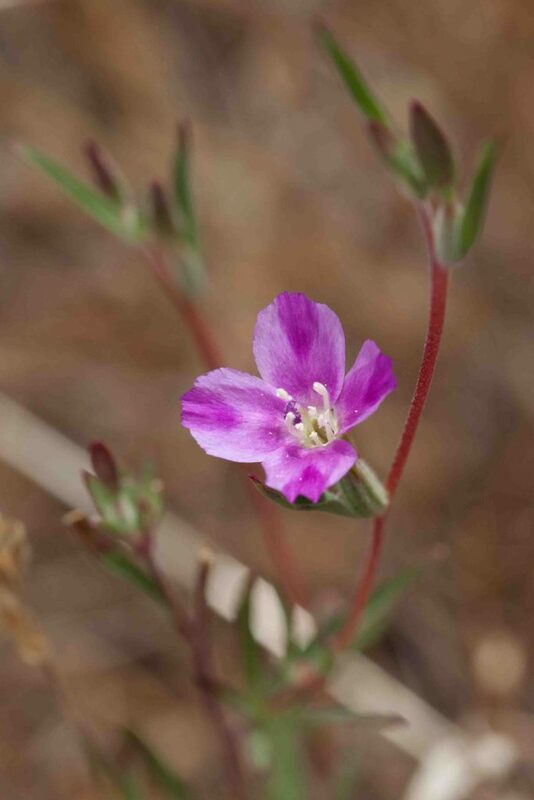 It can be mistaken for Lewis’ Clarkia (Clarkia lewisii) which is occasionally found with deep red petal bases but there are several features that allow the two to be distinguished. 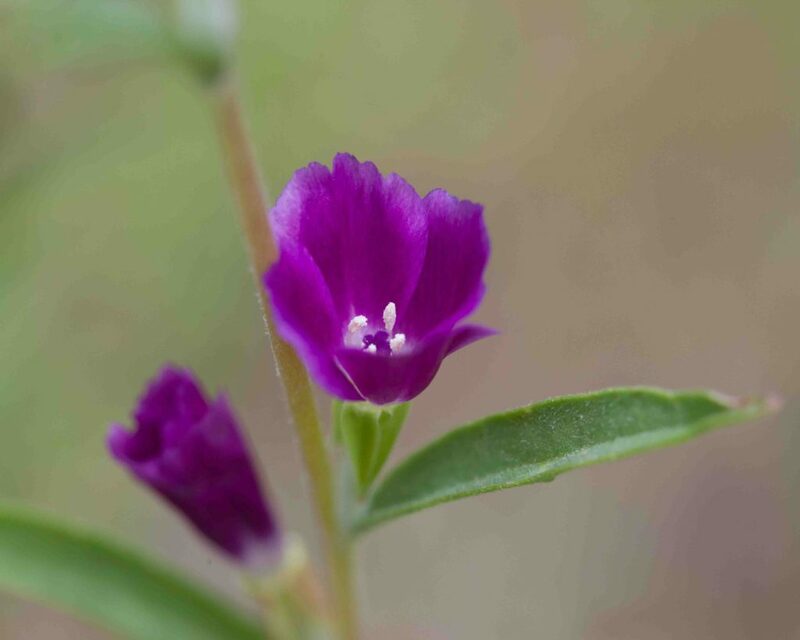 First, the Ruby Chalice Clarkia has erect, not nodding buds. 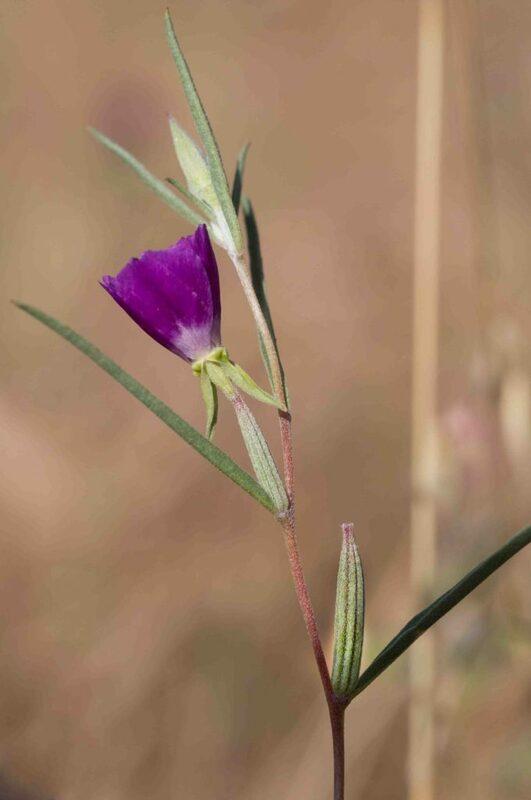 Secondly, its eight anthers are all alike (Lewis’ Clarkia has two sets of 4 anthers quite distinct from one another). 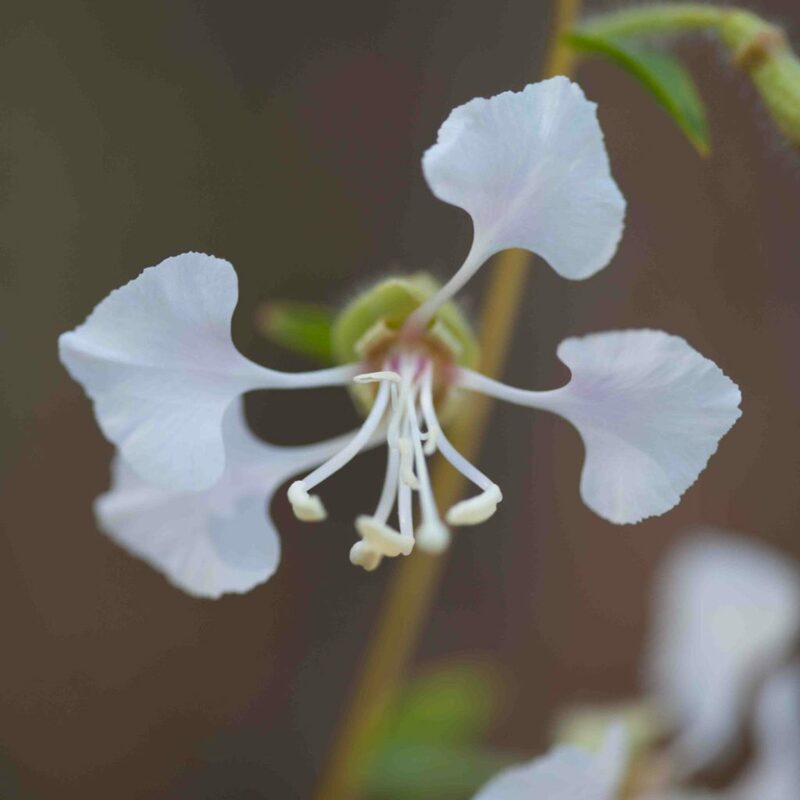 Thirdly (and much less easily visible), the hypanthium in Lewis’ Clarkia has a ring of hairs at its base, the Ruby Chalice Clarkia lacks this feature. 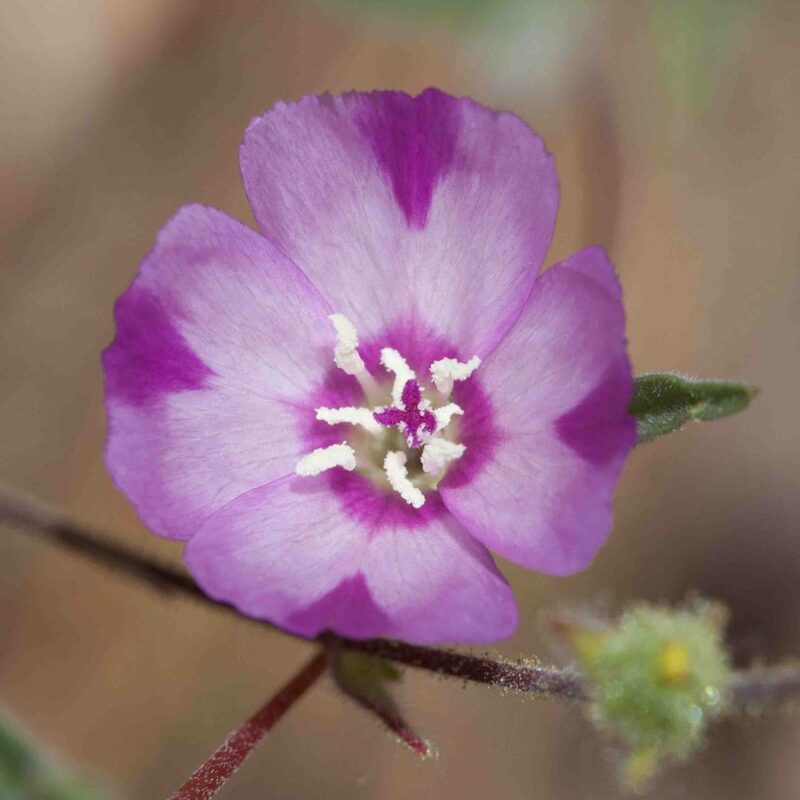 This is very similar to Ramona Clarkia (Clarkia similis). 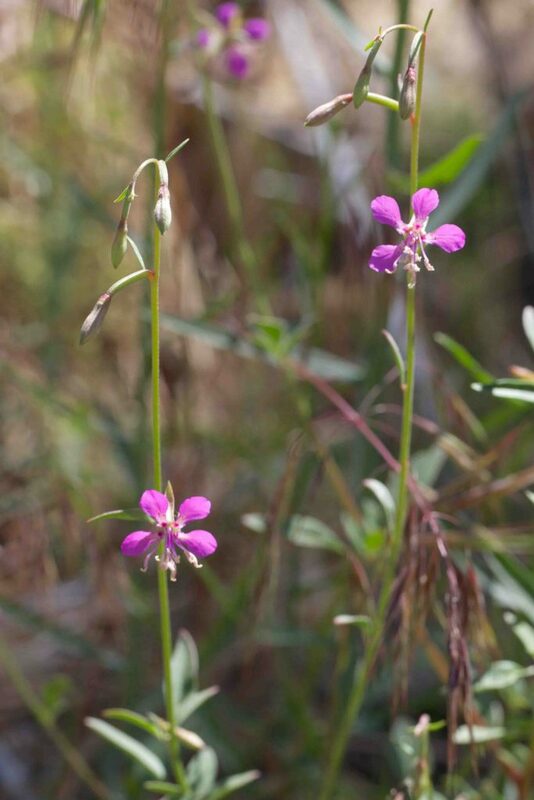 Both have nodding buds and diamond-shaped to oblanceolate petals. 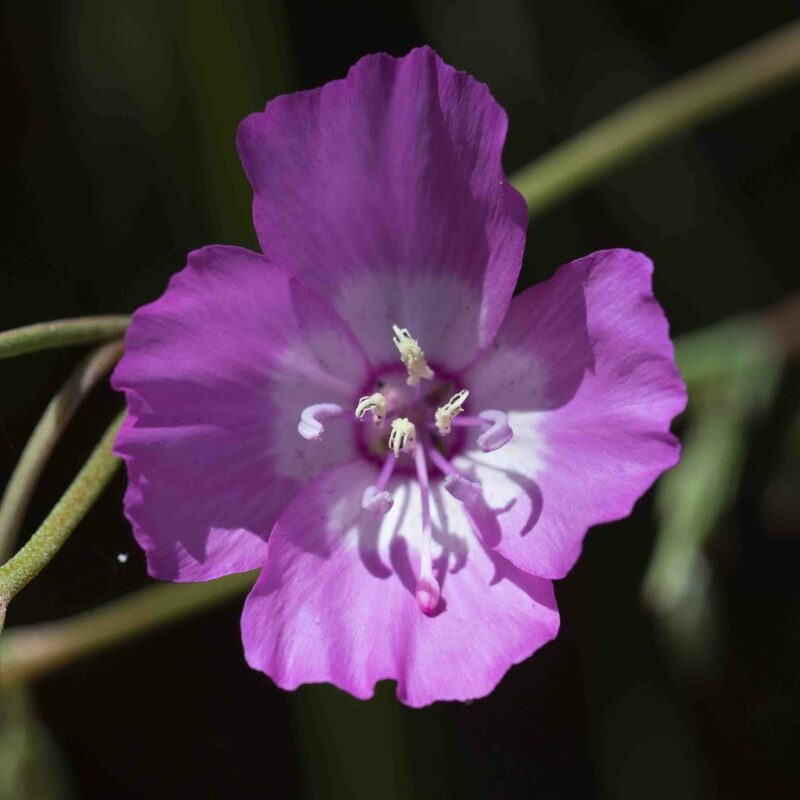 The anthers are variable, the outer being longer and purple, the inner shorter and paler. Fruits are long, slender and 8-grooved. 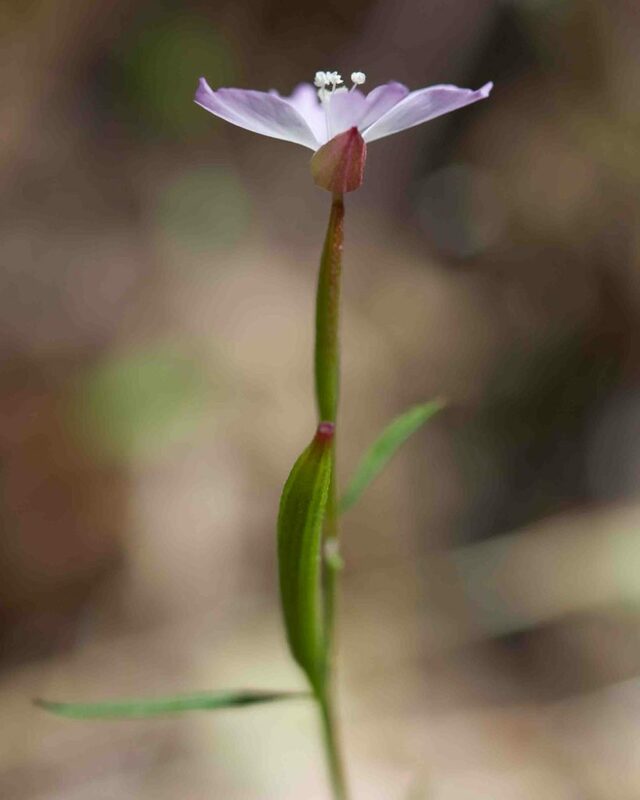 The main (rather slight) differences between the two species is in the size of the petals (this has petals that are 8–12 mm) and their coloration, this has pink petals which are not lighter towards their base. 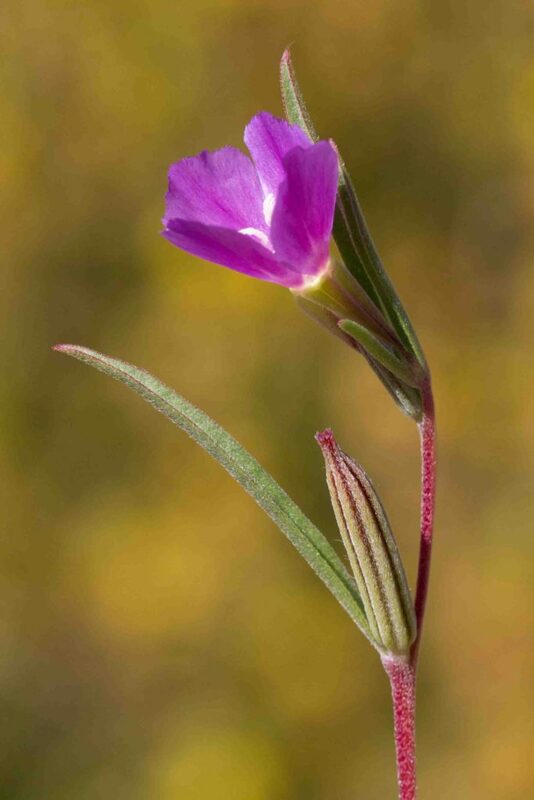 This is very similar to Waltham Creek Clarkia (Clarkia modesta). 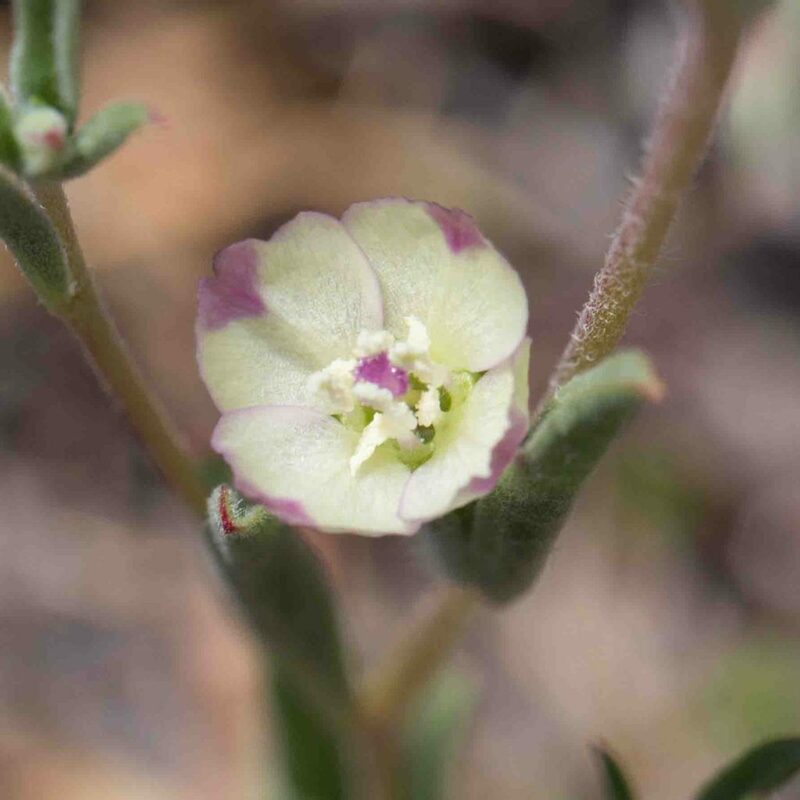 Both have nodding buds and diamond-shaped to oblanceolate petals. 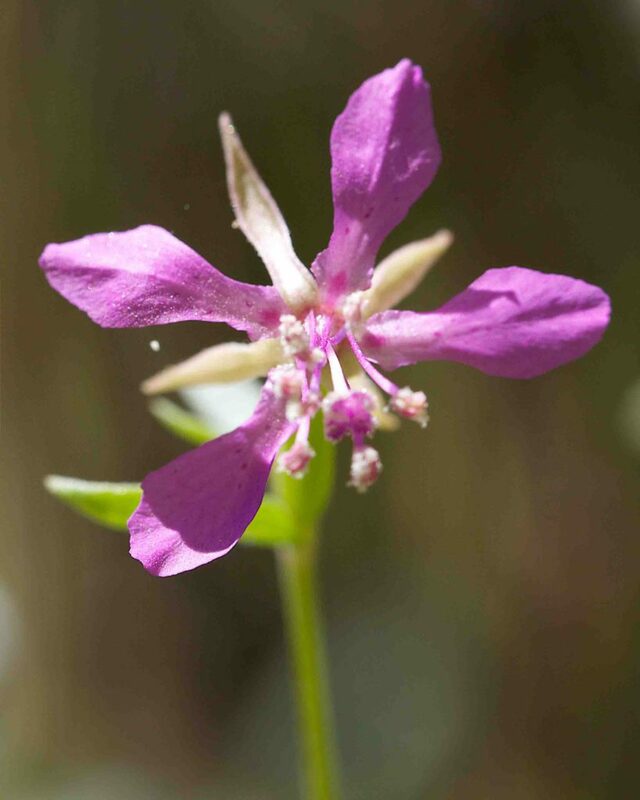 The anthers are variable, the outer being longer and purple, the inner shorter and paler. Fruits are long, slender and 8-grooved. 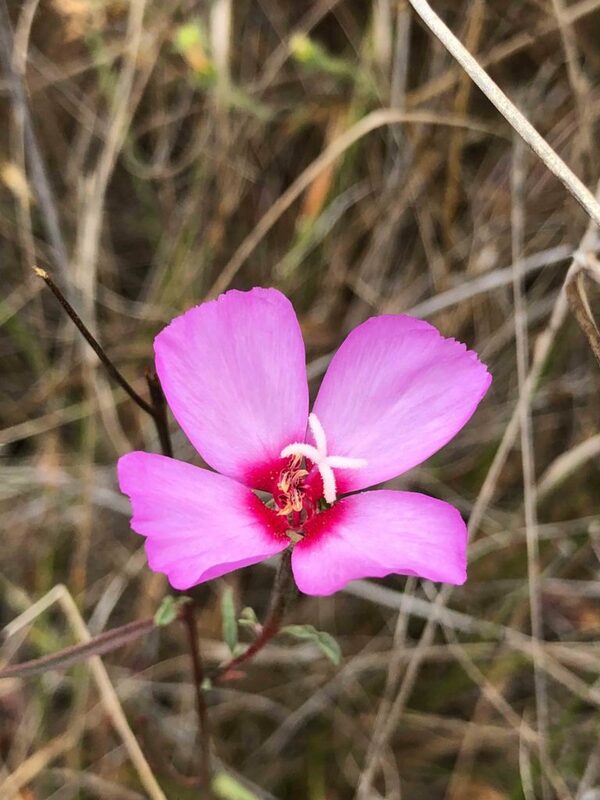 The main (rather slight) differences between the two species is in the size of the petals (this has petals that are 6–10 mm) and their coloration, this has pink petals which are shaded lighter towards their base and are generally dark-spotted or -flecked. 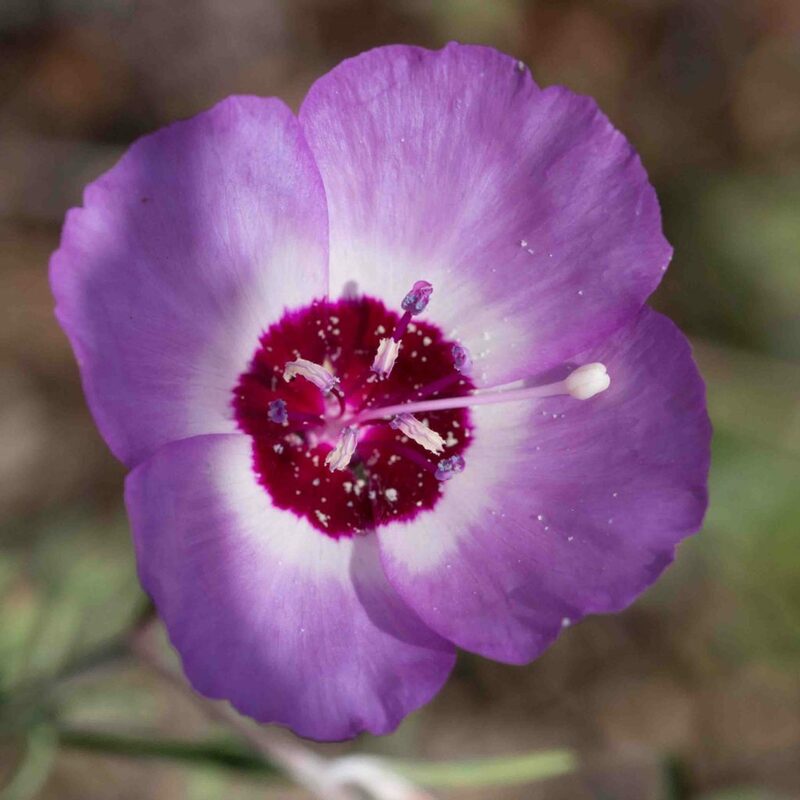 This is an extremely common clarkia but with flowers that are exceptionally variable in their appearance. 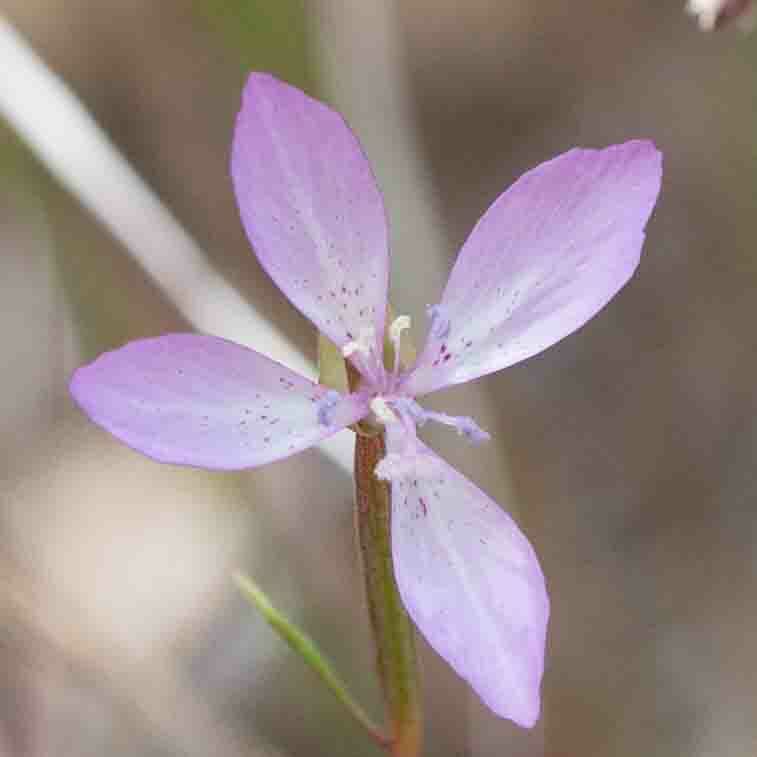 Some are almost white, most are pink, ranging from very pale to very dark; all of these generally have a darker blotch on the margin of each of the petals. 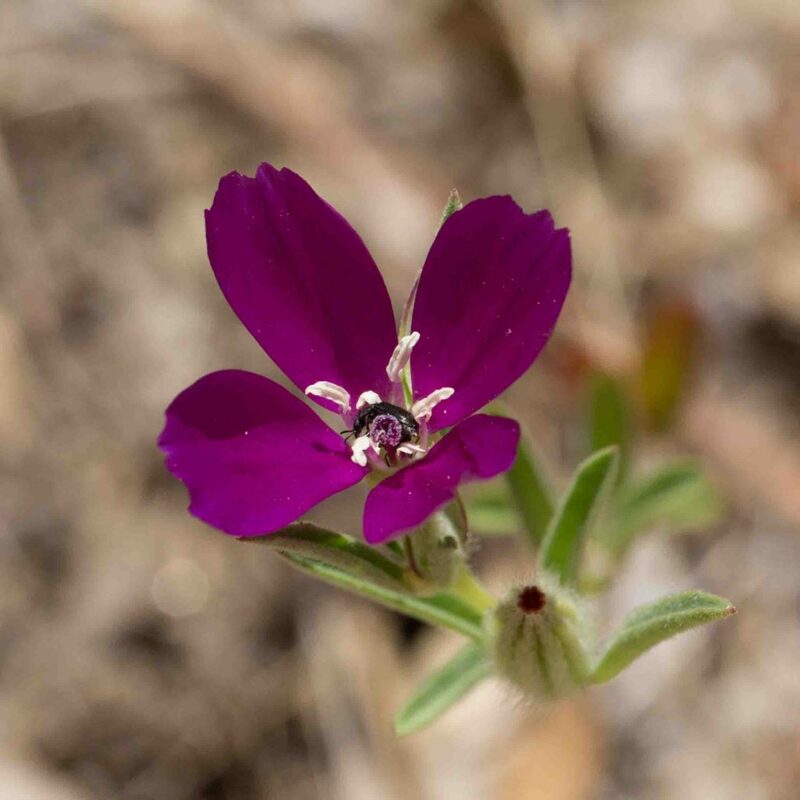 Many are pure deep maroon (these are the ones commonly called Wine-cup Clarkia). 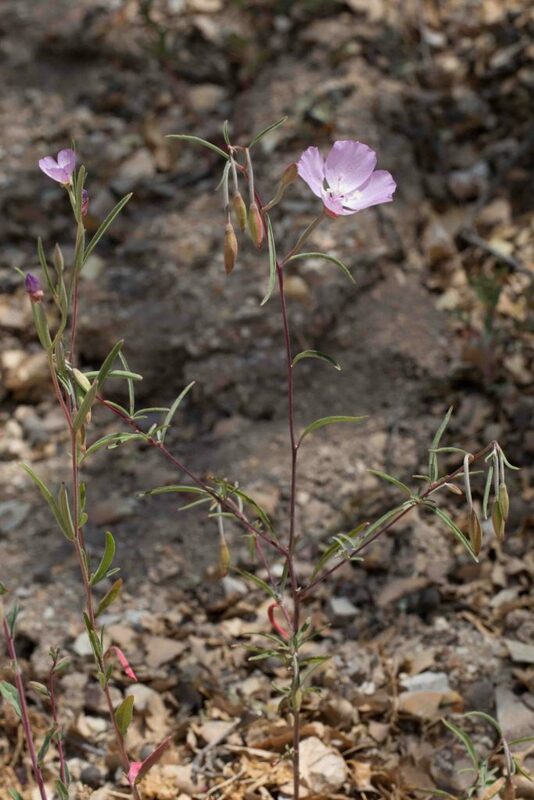 Like Chaparral Clarkia (Clarkia affinis), this clarkia has erect buds and flowers with 8 stamens similar in length and color (sometimes useful in distinguishing flowers that may look like a small Lewis’ Clarkia (Clarkia lewisii)). 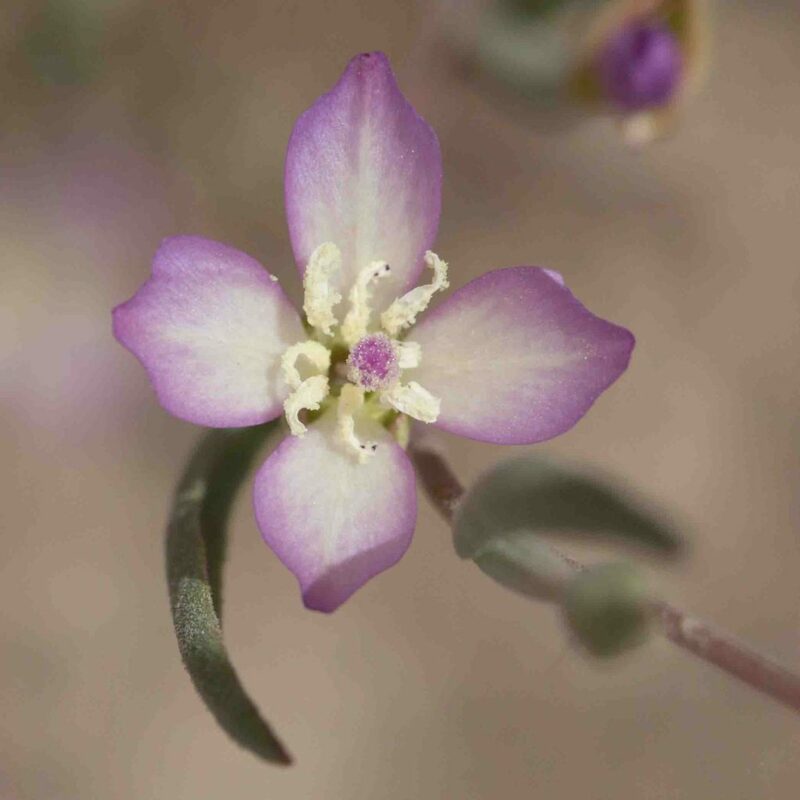 This and Chaparral Clarkia are most easily distinguished by their fruits; this has fruits which are shorter and proportionately fatter (< 8 × as long as wide) than those of Chaparral Clarkia (which are > 9 × as long as wide). 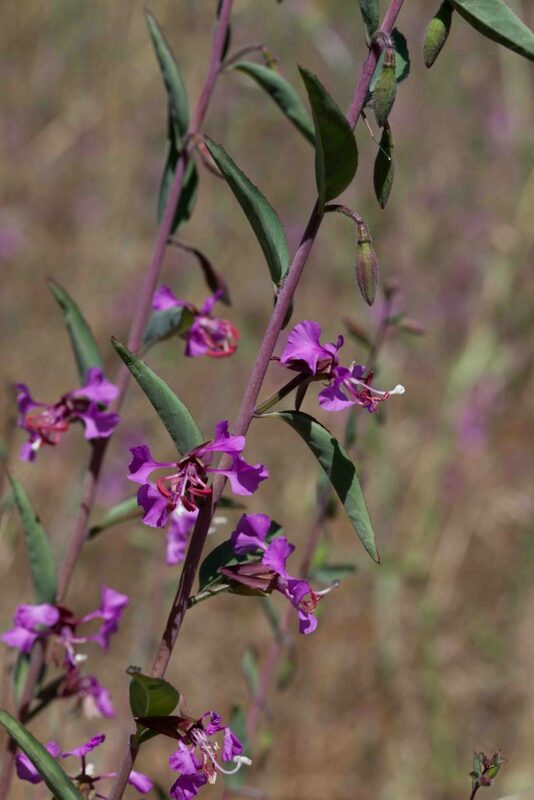 This is a striking clarkia, immediately recognizable with its dark purple-red or lavender flowers, generally with red spots. The plant is decumbent to erect. 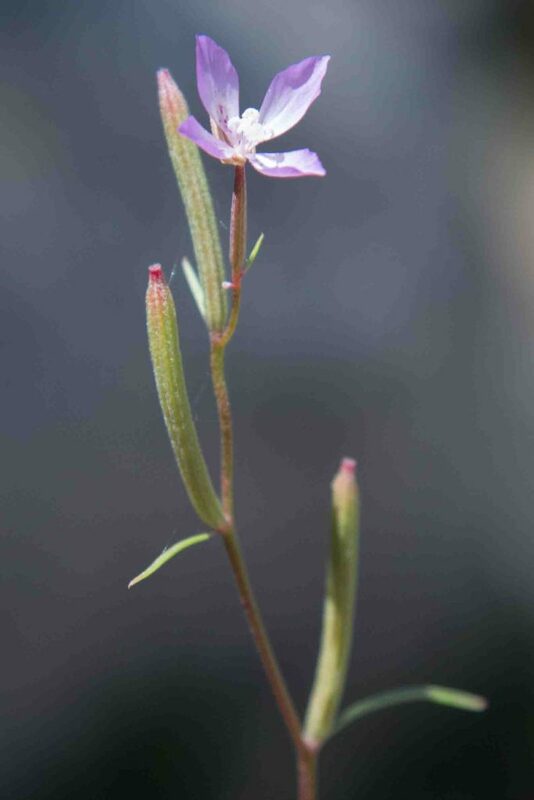 The stigma is prominently exserted beyond the anthers. Buds are erect. 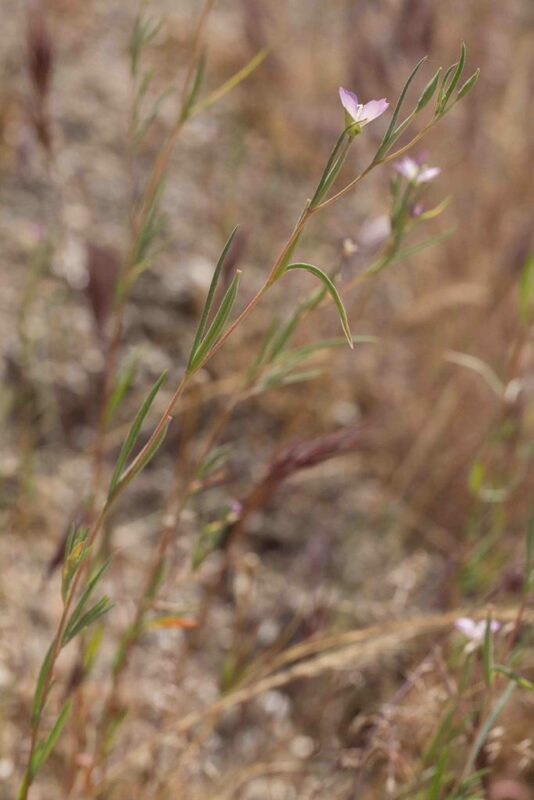 The fruits are conspicuously 8-grooved or -ribbed. 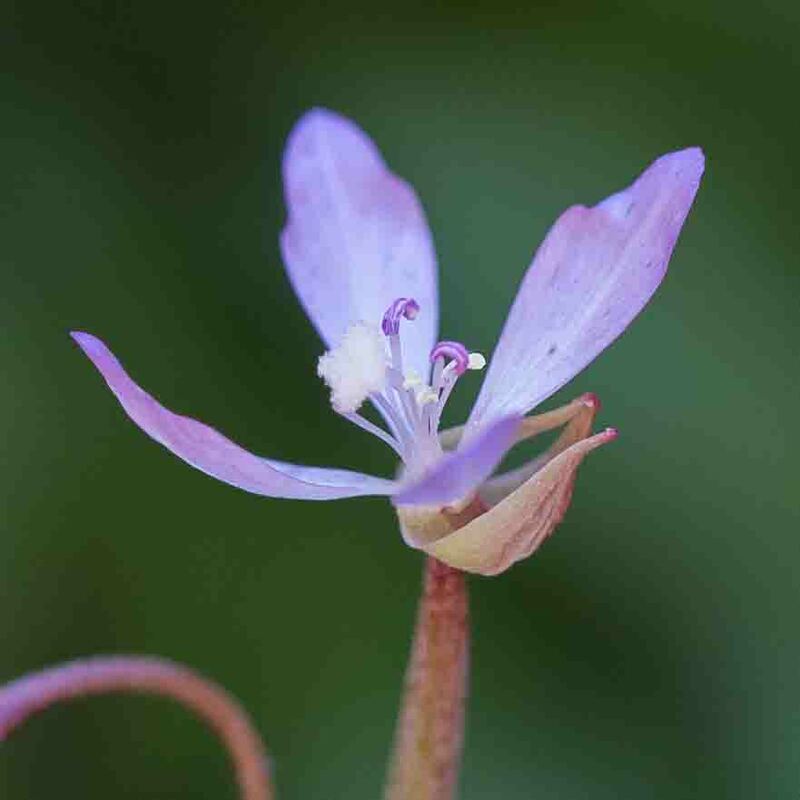 The stem is covered with short, soft hairs. 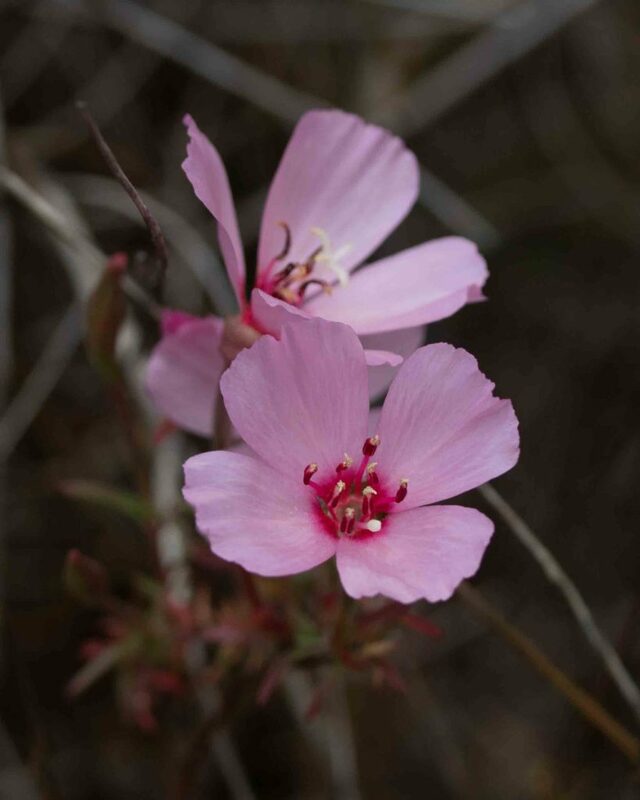 Branches on well-developed plants can be many but few-flowered. 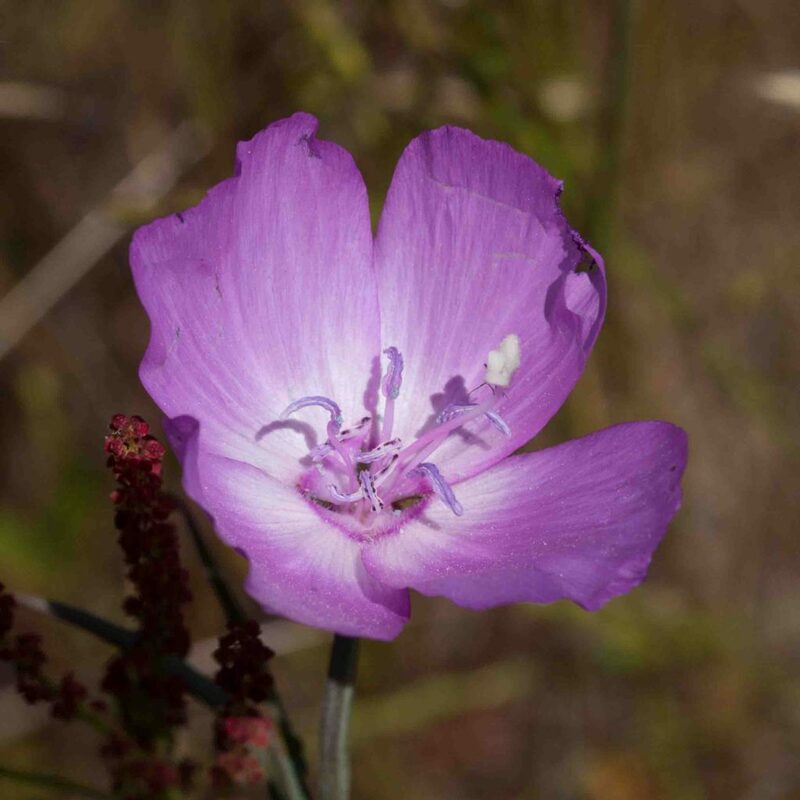 Like Elegant Clarkia (Clarkia unguiculata), this has erect stems with flowers borne at various points along the stem. Buds are nodding. 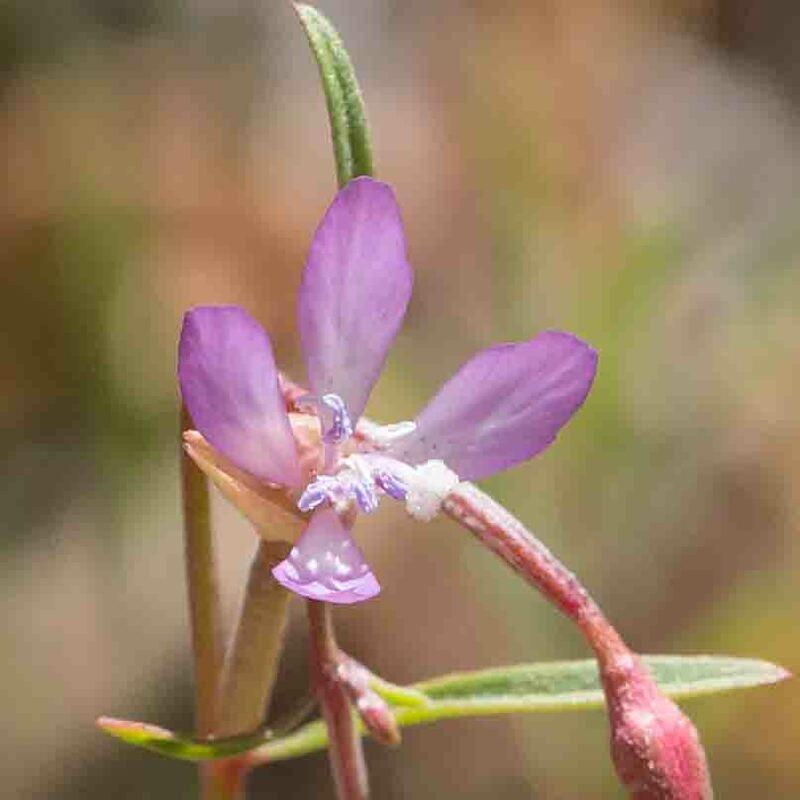 Petals are pink to lavender, narrowly ovate to diamond-shaped, distinguished by the broad claw at the base of the petals and the presence of distinct lobes on the claw. Fruits are 4-grooved. 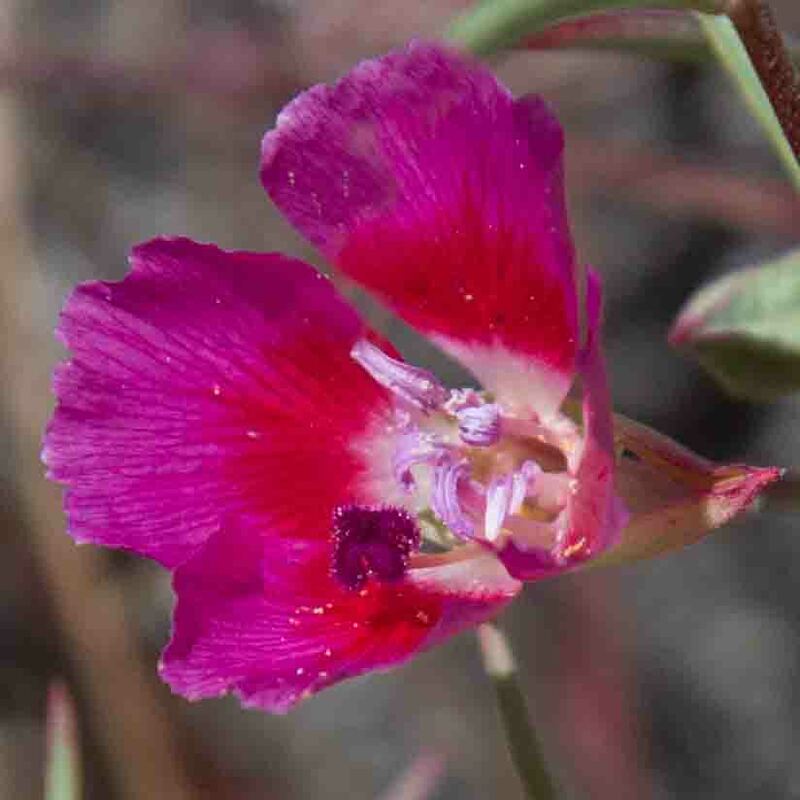 A very common clarkia, immediately recognizable by its spreading petals that are more or less triangular or diamond-shaped, abruptly narrowing to a slender claw. 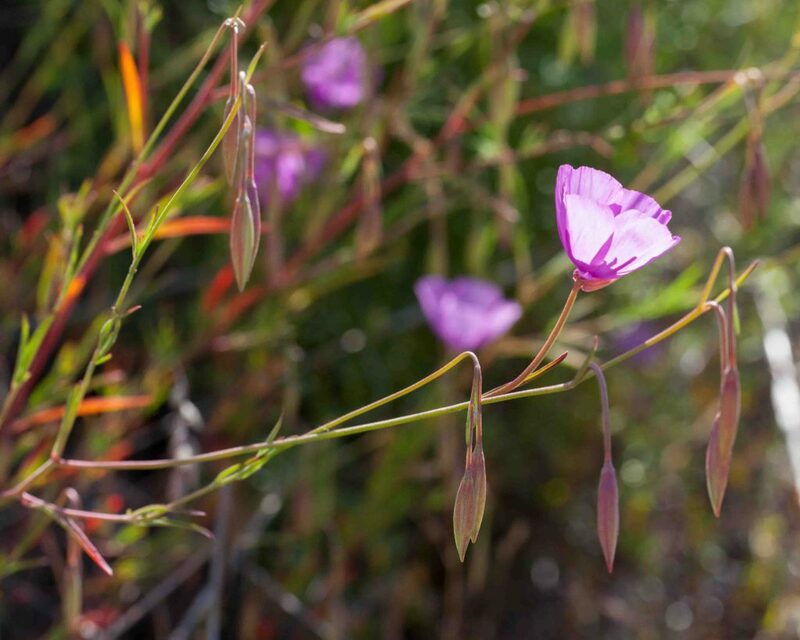 The flowers grow along the length of tall stems, sometimes in profusion, creating spectacular displays. 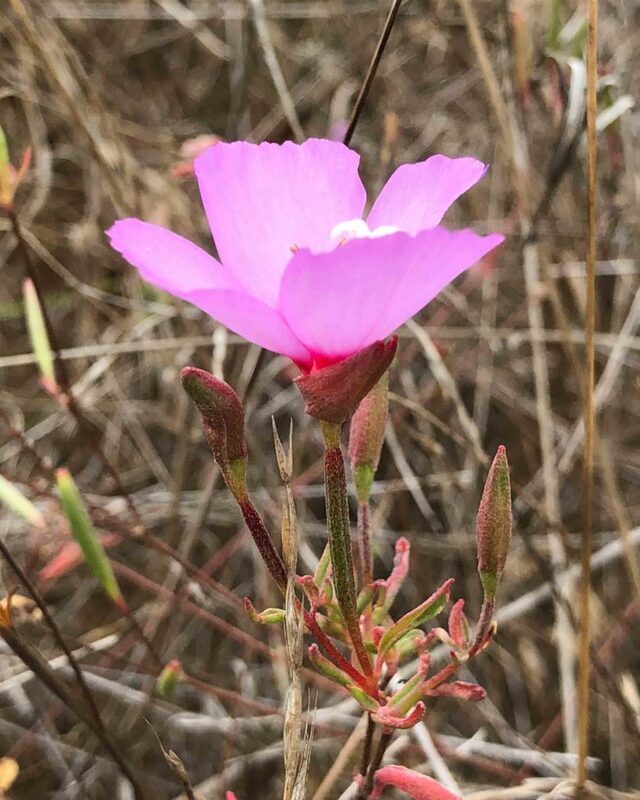 The typical color is dark pink with deep crimson sepals, but it can also be found in salmon pink, red and even white forms. 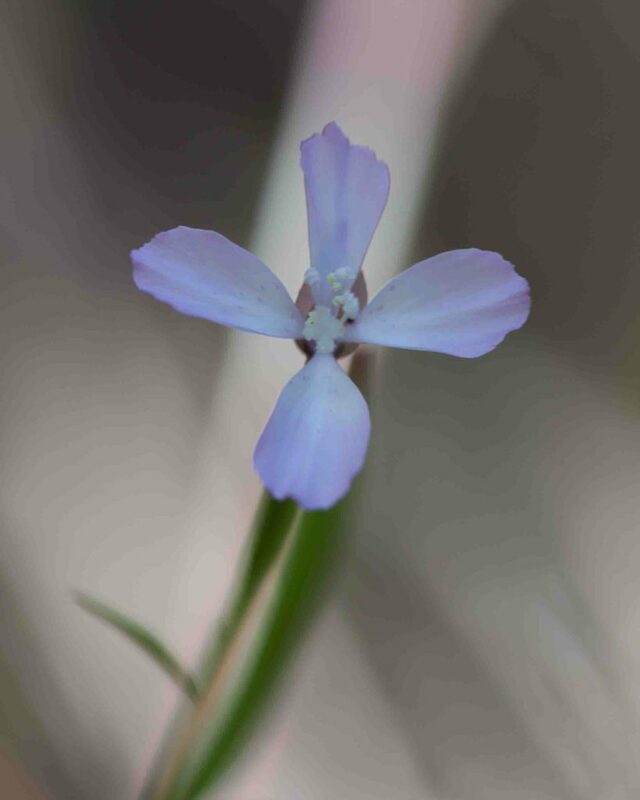 The outer anthers are larger an darker in color than the inner.